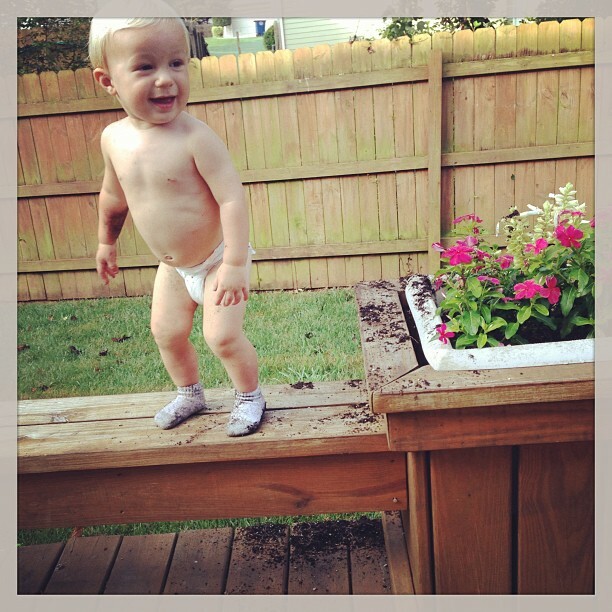 After I had James Michael, I gave a 3-month postpartum update and also wrote a post on body after baby a few months later. My pregnancy this time was different in many ways (another post for another day), and as expected, my postpartum experience has been much different. My little sister is pregnant with her first child and due in early December. When she came to visit me in the hospital after having Beau, I told her I wanted to talk to her about having a baby before it was her time. For me, this time felt so different from my postpartum experience with James Michael just because I knew what to expect. I knew that not everything about delivering a baby and the recovery process would be rainbows and unicorns. But I also knew that you heal more quickly than you think, physically and hormonally. I thought I was fairly fortunate in my delivery with JM to only have two stitches. And when I had no tears or stitches delivering Beau, I didn’t really know what to expect as far as postpartum pain. This time, after leaving the hospital after 48 hours, I didn’t continue any medications unlike last time. The only pain I’ve had has been posterior: in my lower back and my glutes. I know I’ve been rounding my back nursing Beau so I need to make a more conscious effort to hold my shoulders back, and as for the glute soreness, well I have no idea. I know that my glutes (and posterior chain, in general) were really weak during my pregnancy with Beau, which explains the sciatica I experienced early on and was why I cut out many movements during the remainder of my pregnancy that focused on the lower back and glutes. 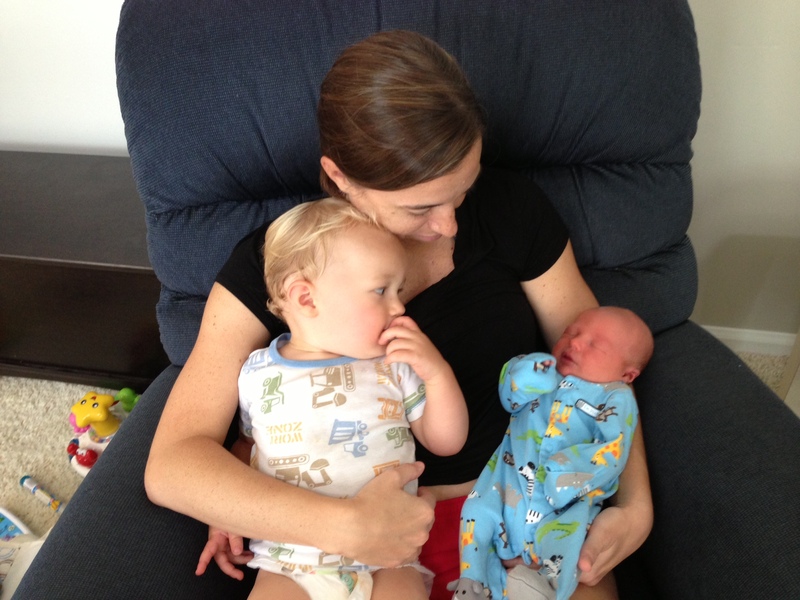 By far, the hardest postpartum obstacle with James Michael was the sleep deprivation. My body healed fairly quickly, so that was no longer a focus. But the lack of sleep was a complete shock to my body. JM nursed every 2.5 hours during the night for weeks, and I found it very difficult to fall back asleep between his feedings knowing that I’d have to wake up again soon. He also didn’t always fall back asleep easily, so between a diaper change and nursing for 25 or 30 minutes, it often took me a while to get him back to sleep. With Beau, whom my mom has nicknamed Angel Baby, it’s been much easier. I’ve been quite well versed in interrupted sleep, from James Michael waking up during the night, to moving to a new house and having a huge to-do list run through my head in the middle of the night, to waking up a million times for bathroom breaks during pregnancy. Yes, I am almost a pro a functioning with far less than 8 hours. But so far, little Beau has been great at night. Sure he wakes up about every 2 to 2.5 hours to eat, but goes back to sleep instantly. When James Michael woke up hungry, the whole house knew it because of his strong cry. It takes a lot of effort just to get Beau to cry, so most of the time I wake up to hear him fidgeting or trying to work up to a cry. And because it is my second baby, it’s much easier for me to fall back to sleep afterwards. After you have a baby, there also is a window of time where you adjust hormonally. With James Michael, it took me longer to adjust than with Beau, though with both babies the one thing that has made me cry centers around their circumcisions. With JM, I cried in the hospital as soon as they took him away for the procedure. With Beau, I knew because of past experience that he would be ok and things would workout just fine, but at his first pediatrician appointment there was bleeding and it caught me off guard and I started crying. With James Michael, I was more anxious in general because everything was so new and I was soooo inexperienced. I recorded every diaper change and feeding, analyzing my notes to make sure he was in the normal range for both. With Beau, I trust more in the natural needs and responses of a baby, and I trust my gut more too to tell me when something really is wrong. For me, all this came with experience. I wrote a post on my experience nursing James Michael during his first 48 hours, and even though those first couple days were hard as we both figured out what we were doing, we found our groove soon after. Though Beau has been a sleepier, quieter baby than JM, he has no less of an appetite. I didn’t have to supplement his feedings in the hospital like I did with JM. My colostrum was enough, and honestly, I think I may have had more of it this time. Right now, I’m feeding him on demand and it’s working out just fine for both of us. He nurses every 1.5 to 2.5 hours, and as much as that may seem a burden, it’s really not. It’s not always easy depending on what JM is up to, but Beau is patient and I’ve had to stop him mid session to tend to JM and he’s never put up a fuss. Admittedly, I have no idea how things will go with a newborn and a toddler. I had a lot of help the first week, and now I’m on my own with both boys for the most part. Sure, family will come visit sporadically, but that constant stream of help is gone. I think the hardest part of adjusting will be keeping JM entertained and out of trouble 🙂 Right now, since Beau is still so young, we’re limited to early morning or evening stroller walks when it’s just me and the boys. I’m not ready to tackle taking both of them out by myself, and even though I may feel braver in a couple weeks, I’m wondering if the typical August heat will set in and limit us to more indoor activities. I had lost weight at my 37 week appointment, weighing in at 21 pounds gained. And a week later at my 38 week checkup, I was plus 24 pounds, gaining three pounds in just a week. It didn’t surprise me, as I had noticed a little swelling beginning at my ankles and because I think my body was just evening out from the weight loss the week before. With James Michael, it took me nearly 3 weeks to lose the baby weight; I gained about 28 pounds. That doesn’t mean my body looked the same as before, but that the weight was gone. I was also much stronger and had more muscle mass when I was pregnant with James Michael versus Beau. I’ve found it is very hard to watch a toddler while in a CrossFit gym with people throwing around tons of weight. This time, the weight has come off even faster. 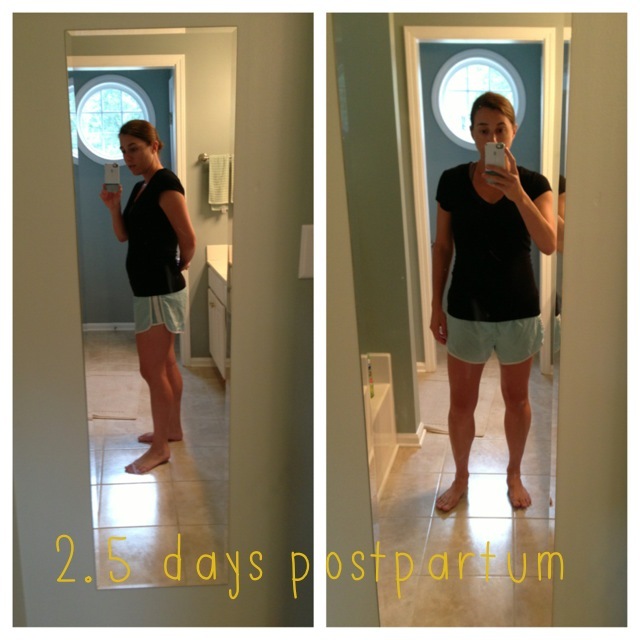 When I got home from the hospital, I was about 9 pounds over my pre-pregnancy weight. 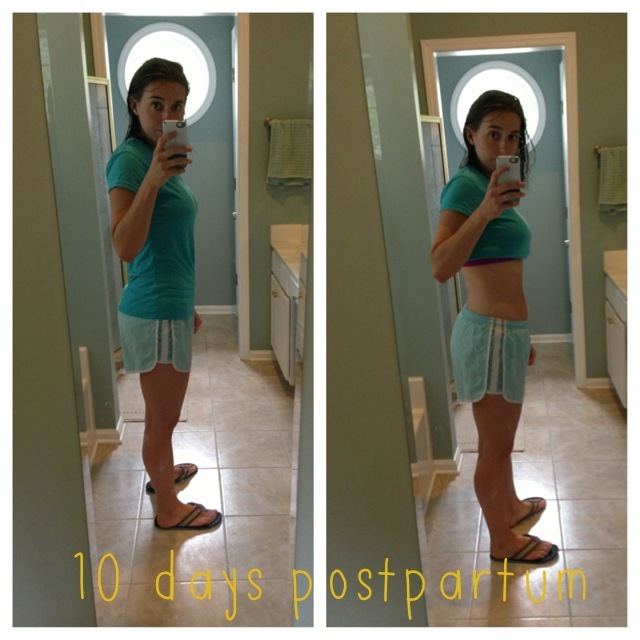 At the one-week mark, I had only 2 pounds to go, and today, 10 days postpartum, I’ve lost it all. Now, as great as that sounds, once again, my body definitely isn’t the same. Weight loss hasn’t been an issue with either of my pregnancies; the hardest part for me will be getting back in shape with a newborn and a toddler, so I’m going to focus my efforts on this for future postpartum updates. I mentioned it in Beau’s birth story, but as much as I want another baby, I want to make sure I get back into good shape first. I don’t want to just look good, I want to feel strong and fit. My body and my mind crave a healthy lifestyle, with splurges, yes, of course. But I’m at my best physically, mentally and emotionally when I eat well and exercise. 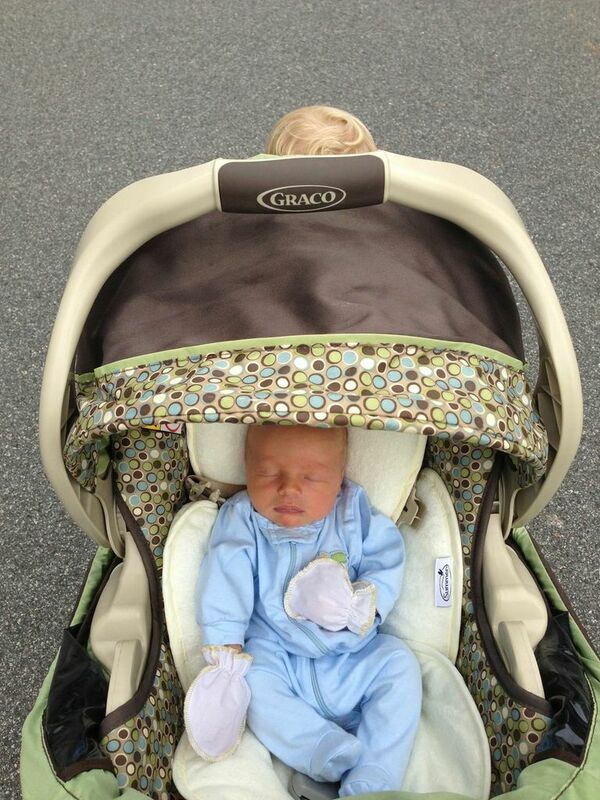 So far, my only form of exercise has been short stroller walks–and those have been more from an effort to keep JM entertained than for my physical activity. I plan to increase the length and intensity of these walks over the next couple weeks. With JM, I did my first CrossFit WOD at 4 weeks postpartum and it was very humbling realizing just how far I had to go to get back into shape. Assuming I’m still feeling good at the one-month mark, I plan to get back into the gym then. Of course, I’ll have to figure out the logistics of it all as the time gets closer. I’m still formulating my fitness goals and my plan of attack. I may start off with something simple such as “Make it to the gym three times a week,” and later, really hone in on specific goals surrounding lifting and skills work. In the meantime, if little Beau can start spacing out his feedings to 3 or 4 hours at night by the time he’s a month, this mama will have much more strength and energy to get to the gym!